I have posted this a couple times over the years on Thanksgiving Day. Knowing our history is important and I am always struck reading historical documents about the uniqueness of times that this nation has endured throughout our 241 year history. 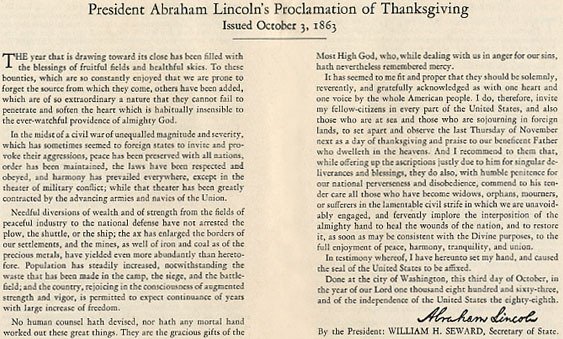 Interesting to me also is that Lincoln believed the Lord was "dealing with us in anger for our sins", no doubt a reference to the Civil war that was occurring at the time Lincoln gave this proclamation. Many feel that way still today. I am one who believes that the Lord is dealing with us in Grace, as this is the age of grace (Rom. 6:14, Titus 2:11, John 1:17, Eph. 2-4:9) because of the forgiveness possible at the Cross, despite our sins. And our sins always bare consequences with which we must contend, because of the law of sowing an reaping and is as a natural result of acting or living out of the Will of God. It may also be worth mentioning that Lincoln's proclamation was a two-parter. Not only should it be a day of givng Thanks to the Lord, but it should also be a day of Praise to Him. Therefore it would be accurate not to "celebrate" the holiday we call "Thanksgiving", but rather to actually BE THANKFUL to God for all He has done for us as American's and to PRAISE the LORD! George Washington's Thanksgiving proclamation is here.